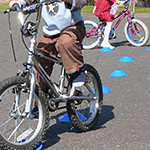 Cycling Scotland launched its “expert” campaign on social media last week, with the aim of piquing the interest of parents and encouraging them to find out if their child’s school offers Bikeability Scotland cycle training – the national standard aligned cycle training programme for school children. 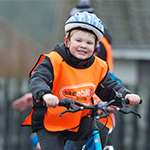 The campaign shows two very keen 10 year olds, armed with the knowledge from their Bikeability Scotland cycle training, showing their parents some basic tips for staying safe while out on the bike. The “expert” theme emerged following some very interesting focus group discussions. We needed a campaign that would engage parents, give a little taste of what the training covers and was compelling enough to make them enquire about training for their child. “If I think about my little girl, she’d love to be the one teaching me this life skill”, said one parent. “What kids actually get taught is probably better than I could teach them”, said another. On a (very) chilly December morning, the Cycling Scotland team, one of our best cycling tutors, the film crew and our child stars filled a small garage in Edinburgh and started filming. The stars of the show, the kids, were great and the determination, dedication and ability to stay warm was second to none. And so here we are. Four videos, a four week campaign and several hot drinks later. 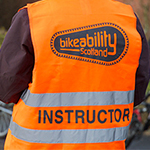 If you’d like to know if Bikeability Scotland cycle training is available at your child’s school, enter your school name on this page. Your local authority coordinator will be able to advise you on the next steps.